The Federation of Malaysia, in total about the same size (329,750 square kilometres) as the U.S. state of New Mexico, is in Southeast Asia and comprises two regions: Peninsular Malaysia (11 states) and the Island of Borneo (which includes two states, Sabah and Sarawak). The South China Sea separates the two regions. To the north of Peninsular Malaysia is Thailand, and to the south, Singapore. Indonesia surrounds Sabah and Sarawak, and the latter shares borders with Brunei as well. The landscape ranges from coastal plains to hills and mountains, as well as lovely sand beaches. Trees cover nearly three-quarters of the total area. The capital city is Kuala Lumpur. Located near the equator, Malaysia experiences a tropical climate. While it can get very humid (with monsoon seasons) it never gets extremely hot – average temperatures are from 20° to 30°C. Malaysia’s first inhabitants are said to have been immigrant ancestors of the Orang Asli, who arrived 5,000 years ago from China and Tibet. The Malays, who brought with them skills in farming and the use of metals, followed them. The Hindu-Buddhist period began around the first century B.C. and is evident in the temples of the Bujang Valley and the Merbok Estuary in Kedah in the northwest of the peninsula, near the Thai border. This era came to an end when Islam was introduced by Arab and Indian traders in the 13th century. At this time, the Malay-Hindu rulers of the Melaka Sultanate, the Malay kingdom which ruled both sides of the Straits of Malaka for over a hundred years, converted to Islam. This change had a profound effect on Malay society. Malaysia was also influenced by the British colonial presence in the 19th and 20th centuries. Following World War II, Malaysia became an independent member of the British Commonwealth. At present the Malaysian population is over 28 million people. Its ethnic composition is roughly Malay 53%, Chinese 26%, indigenous 11%, Indian 7%, and others 8%. By constitutional definition, all Malays are Muslim. Despite the overall majority of Malays, non-Malay indigenous groups make up more than half of Sarawak’s population and about 66% of Sabah’s. Other than Islam (at 60%, the dominant religion), the other practised religions are Buddhism (19%), Christianity (9%), and Hinduism (6%). The official language is Bahasa Melayu, but various dialects of Chinese, English, Tamil, as well as indigenous languages are also spoken. Malaysia is a cultural mosaic. While many cultures contribute to Malaysia’s identity, some have had especially lasting influence on the country: the ancient Malay culture and the cultures of Malaysia’s significant trading partners throughout history – the Chinese and the Indians. These three groups are joined by a multitude of indigenous tribes, many of which live in the forests and coastal areas of Borneo. Although each of these cultures has vigorously maintained its traditions and community structures, they have also worked together to create contemporary Malaysia’s uniquely diverse heritage. Despite the various ethnicities, there is a common reverence for the family structure, and for polite, harmonious, respectful conduct. And though the Malaysian constitution declares Islam to be a founding guide for Malaysian culture, there is also a great deal of tolerance for other ethnicities and religions. 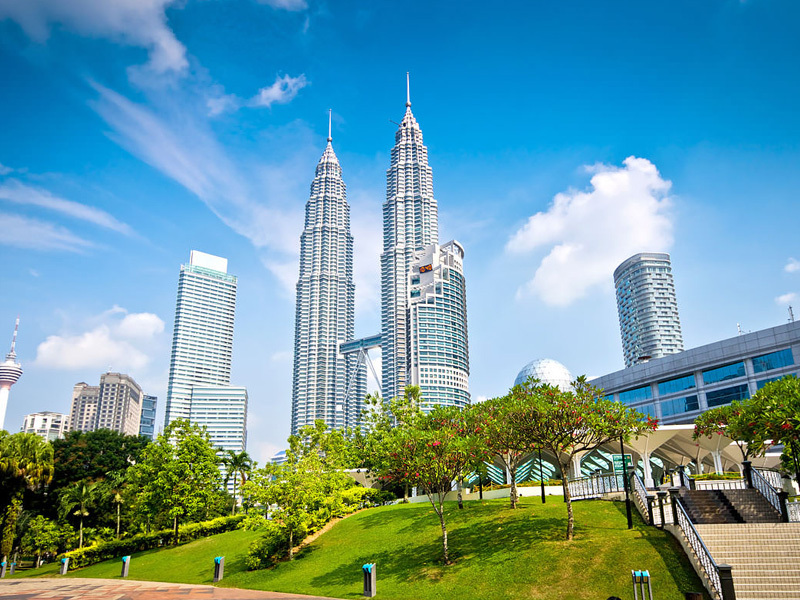 The Malaysian economy is known for its relative stability and general growth track. After an economic boom in the 1970s, Malaysia diversified successfully and transitioned from being a mainly raw materials producer to a top exporter of manufactured goods, earning it the designation “newly industrialised country.” It is a significant producer and exporter of palm oil and rubber; crude petroleum and liquefied natural gas; cocoa and pepper; apparel; and timber and wood products. Major markets for Malaysian exports are Singapore, the U.S., Japan, and China. The currency is the Ringgit. Malaysia practises parliamentary democracy with a constitutional monarch heading the country. The Federal Constitution underlines the separation of governing powers between the executive, judicial, and legislative authorities. The separation of power occurs both at the federal and state level. The cost of living in Malaysia is exceptionally low for a newly industrialised country. Housing/renting, food, and eating out are very reasonable, and taxes are relatively low. The average Malaysian spends around 150 Euros every month on food. The website Study Malaysia notes that Kuala Lumpur city was rated the least expensive city in the world in terms of food, electronic goods, clothes, public transport, hotel rates and entertainment for Western visitors, in a recent survey of 71 cities worldwide by the Swiss banking giant UBS. The living standard in Kuala Lumpur (KL) is in general quite high. Malaysia has a good health care system, good hospitals, good international schools, excellent highways, and modern communication systems. The Education Act 1996 covers pre-tertiary levels of education under the national education system, which comprises pre-school, primary, and secondary education as well as post-secondary education. Primary and secondary education are free to students in Malaysian government schools. Another six acts regulate the provision of higher education in Malaysia. The Minister of Higher Education controls all tertiary education. There are two types of tertiary education in Malaysia: government-funded and private higher educational institutes. Most private higher educational institutions teach courses in English. However, while most post-graduate courses at public universities are taught in English, most bachelor’s degrees at public universities are taught in Bahasa Malaysia. The legal regulatory frameworks that support the provision of education in Malaysia are The Private Higher Education Institutions Act 1996, The National Council on Higher Education Institution Act 1996, The Malaysian Qualifications Agency Act 2007, The Universities and University Colleges (Amendment) Act 1996, The National Higher Education Fund Corporation Act 1997, The MARA Institute of Technology (Amendment) Act 2000, and The National Higher Education Fund Corporation (Amendment) Act 2000. To study in Malaysia, international students should apply directly to the institution they would like to attend; student counsellors can help students assess whether this school is licensed and approved by the relevant regulatory bodies of the Malaysian government. International students coming to Malaysia must obtain a student pass. This is done by applying and being accepted to the institution of choice. It normally takes three to five weeks to obtain the student visa approval. Before purchasing flights, students should check with the Malaysian High Commission/consulate in their home countries about whether they need a visa to enter Malaysia along with the Student Pass approval letter. If they do need one, they should proceed to the nearest local Malaysian diplomatic mission (i.e., Malaysian High Commission Consulate) and show them the approval letter to obtain their single-entry visa. The student approval letter is usually valid for three months from the date of issuance. International students can work part-time in Malaysia under strict guidelines whereby they can work only during semester breaks for a maximum of 20 hours a week. Only certain workplaces are permitted (for more information, contact Malaysian immigration). All applications to work must be approved through Malaysian Immigration.